Sekisui XenoTech has just established a method for high Aldehyde Oxidase and Xanthine Oxidase activity in pooled Human liver test systems. These new test systems (Pooled Human Liver S9 and cytosol) have been prepared from tissue treated to preserve high Aldehyde Oxidase (AO) and Xanthine Oxidase (XO) activity, yet without significantly impacting major cytochrome P450 (CYP) activity. Non-transplant quality human livers donated for research are a common source of both hepatocytes and subcellular material utilized in in vitro drug metabolism studies. At the time of organ recovery, livers are flushed with an ice-cold perfusion and storage solution that preserves the tissue during delivery from the recovery site to the research facility. The two most commonly used cold storage solutions are University of Wisconsin (UW) solution and Custodiol histidine tryptophan ketoglutarate (HTK) solution. One notable difference between these two solutions is the presence of 1 mM allopurinol in the UW solution. Researchers at Washington State University had previously shown that 1 mM allopurinol inhibits XO activity in human liver cytosol. 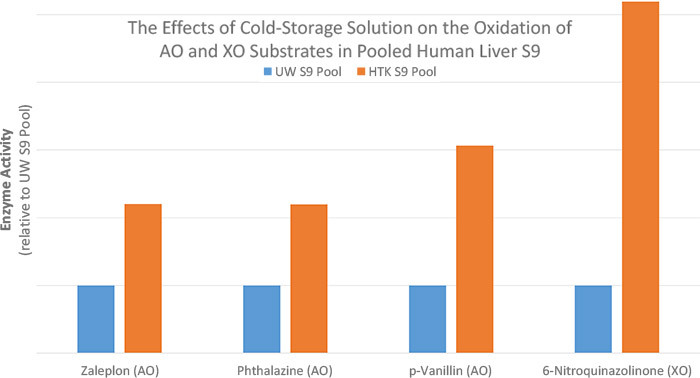 Concerned that the exposure of human livers to allopurinol could lead to an underestimation of the contribution of XO in the metabolism of new chemical entities, Sekisui XenoTech scientists also set out to evaluate XO and AO activities in S9 subcellular fractions prepared from human livers that were flushed and stored in UW solution or HTK solution. To determine whether UW or HTK affected other drug metabolizing enzymes, the metabolism of selective marker substrates for the major CYP enzymes was also examined. Feel free to contact me if you wished to receive more information on these newly released cellular fractions. If you have an interest in aldehyde oxidase activity, you may also be interested in the human aldehyde oxidase from Cypex (CYP150), a cytosolic extract of Escherichia coli expressing recombinant human aldehyde oxidase.